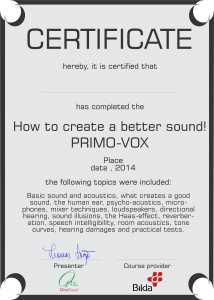 PRIMO-VOX, How to create a better sound! This course provides an overview of the most important factors that govern what is required for a good sound. The course has a strong emphasis on the importance of collaboration in which the performers must work with those who manage the sound. It is only then that one can make it sound really good. This collaboration is an important factor that is often forgotten. An introduction to speech perception and the factors that govern this. Many real examples are from different churches and venues to illustrate why it is becoming such a big difference. At the end of the course are also given some demonstrations where some important psychoacoustic effects are demonstrated. These usually create discussion and amazement but also provides an insight into the existence of factors other than purely technical which controls slutresultatet.lera example where we use only two speakers dealt with up to 2000 seats. Do not hesitate, contact us for your next event. 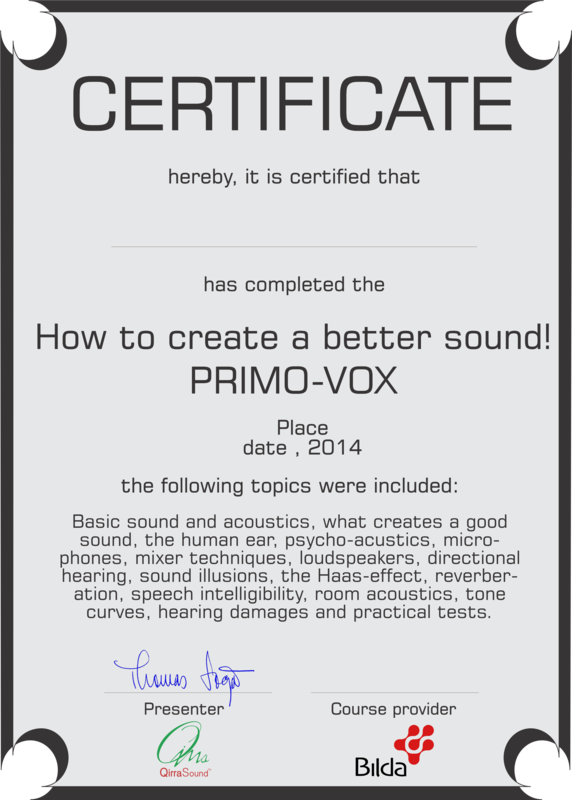 Pre-knowledge: A sincere interest in regards to what creates a good sound and high intelligibility!